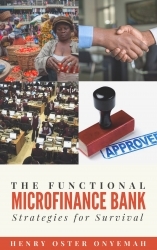 Nigerian writer, Henry Oster Onyemah, in his book "The Functional Microfinance Bank" discusses every aspect needed to operate a microfinance institution for optimal performance. Lagos, Nigeria, July 26, 2018 --(PR.com)-- In "The Functional Microfinance Bank," Nigerian writer, Henry Oster Onyemah, discusses every aspect needed to operate a microfinance institution for optimal performance. With nine chapters highlighting the microfinance bank, the client, the target market, the staff, the loan, the lending methodology, the organizational structure, the management policies and the recovery strategies, "The Functional Microfinance Bank" is borne out of the author's desire to impact passionate micro financing in the hearts of stakeholders. This book adopts a practical approach for learning with the use of in-depth analytic tools, highlighted definitions, articulated case scenario and well-selected main and sub headlines. Available on Amazon, Barnes & Noble, Google Play Books, Kobo, Apple iBooks and 400 more online bookstores worldwide, "The Functional Microfinance Bank" is sold at US$3.99. This book emphasizes that microfinance institutions need set of tools, people and processes to function effectively, and it also offers extensive practical approach to staff attitude towards planning and execution. While writing this book, the author's intention is to acquaint readers with events that currently take place, and the corresponding actions to be taken in order to sensitize the microfinance industry for productivity. Another important mission of this book is to equip readers with adequate knowledge relevant to the industry prompting professional in every practitioners chosen career. Henry Oster Onyemah is a dynamic Nigerian writer and a certified microfinance practitioner, with expertise in credit risk administration and loan recovery strategy formulation with on the job practical experience of over ten years. Onyemah is a microfinance certified professional and a member of the Chartered Institute of Bankers of Nigeria (CIBN), a certified expert in Microfinance (CEM) professional from Frankfurt School of Finance & Management and a graduate of the University of South Wales. Henry is an associate member of the Nigerian Institute of Management (ANIM) and the Chartered Institute of Loan and Risk Management (ACILRM). He is also a senior associate member of the Association of Enterprise Risk Management Professional. Vast in security management and intelligence gathering with several written articles, most of which centers on micro financing, profit maximization, loan and recovery strategy formulation, Onyemah is a resource person with practical experience in freelance writing, training and consulting with passion for micro financing. "The Functional Microfinance Bank" is published by Publiseer, a Nigerian digital publisher. Founded in August 2017, Publiseer has distributed over 150 books by Nigerian writers.